Good news for the EU, as world leaders pledge not to aggressively devalue currencies – but there’s no concrete action. 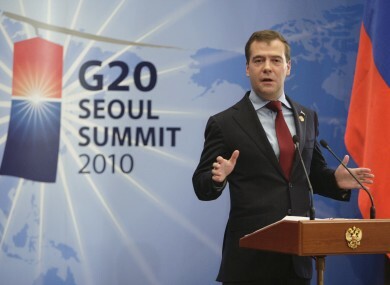 Russian president Dimitry Medvedev speaks to reporters at the conclusion of the G20 summit in Seoul. LEADERS OF THE WORLD’S major economies have agreed at a summit in South Korea not to pursue measures that would actively devalue their currencies – avoiding a so-called ‘currency war‘. Completing a two-day G20 summit in Seoul, the nations released an “action plan” – outlining a range of various macroeconomic policies that the members, including the UK, US, China, Russia and the European Union, would commonly pursue. CNN reports that the goal of the plan is to avoid the recurrence of the current economic slump, should similar circumstances ever arise again – and includes a pledge to “refrain from competitive devaluation of currencies”. While this is more fundamentally significant for the US and China – each of whom has recently taken umbrage at the other, over accusations that their currencies are becoming deliberately weak so as to boost exports – it is also good news for ailing European nations like Ireland, who do not have had the ability to devalue their own currency. The agreements reached fell short of one of the US’s main goals, however – that of putting a limit on trade deficits, which the BBC suggests would threaten global growth. President Barack Obama, nonetheless, has welcomed the agreement, saying that exchange rates had to “reflect economic realities”. The summit had also earlier seen a joint declaration from the individual EU members present – the UK, Germany, France, Spain and Italy – which had sought to stave off fears that they would force Ireland into defaulting on its bond payments, saying an amendment bailout mechanism would not come into effect until mid-2013. Alson on the agenda was approval of IMF reform which gives nations like China – as well as developing states – a bigger say in its affairs. Email “G20 leaders agree to avoid global 'currency war'”. Feedback on “G20 leaders agree to avoid global 'currency war'”.